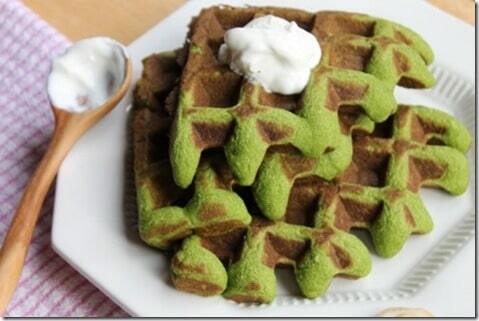 Ditch the Box and Make a Healthy Breakfast! Where’s the free toy that used to come in breakfast cereal? It’s not the only thing missing from the box these days. We’ve been duped to think that breakfast variety equates to many different colors of cereal boxes festooned with various cartoon characters or health claims. In reality, all those hundreds of different boxes contain strikingly similar ingredients and probably don’t do much for our bodies in terms of varying our nutritional intake. They certainly don’t give us a leg up on our 5-a-day fruits and vegetables, don’t offer healthy and satiating fats, and often include questionable ingredients that aren’t usually found in an average kitchen or in nature. If you feel like breakfast from scratch is unattainable, like real food takes too long for your busy lifestyle, like your mornings are forever stuck at Cereal 1.0 – I’ve got an upgrade for you. 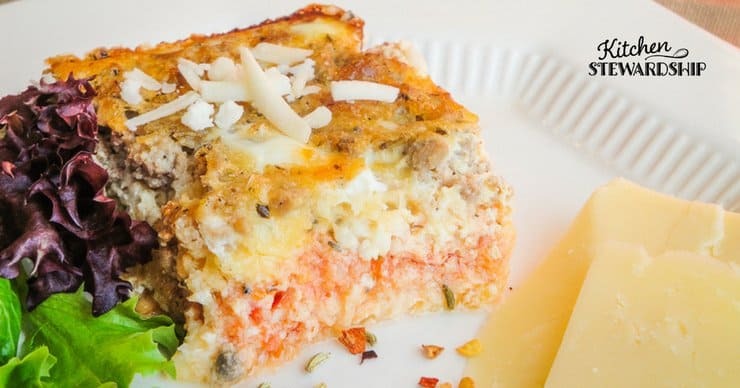 Packed with over 50 family-friendly, very doable real food recipes, The Healthy Breakfast Book: Cereal Free Secrets to Starting the Day with Real Food is your solution to processed food mornings and that 10 a.m. energy crash. 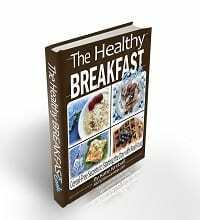 The book starts with 10 Secrets to Real Food Breakfast Success, key foundational habits you can put in place today, and the tips to keep your kitchen running smoothly don’t stop until the real food company meal plans and breakfast hosting philosophies 154 pages later. The well-known Kitchen Stewardship technique of answering all your FAQs before you even need to wonder if something can be substituted in a recipe (and more) will not disappoint. The recipes are nearly all gluten-free and nut-free and at least two-thirds are either dairy-free, egg-free or grain-free, and the book even includes another 50+ resources online to help you achieve real food independence. 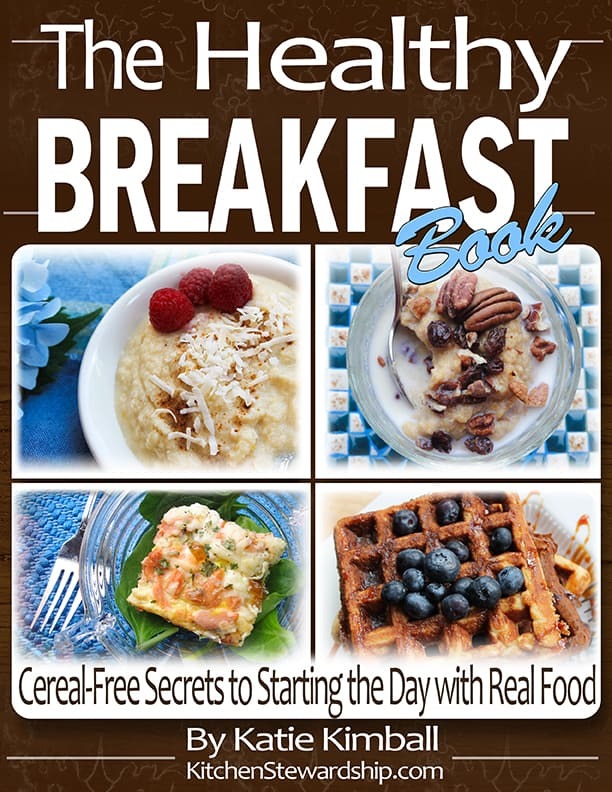 Break free from the cereal box and fuel your day the right way with The Healthy Breakfast Book. You automatically get the premium package when you buy at Kitchen Stewardship, with a full-color 154-page PDF enhanced with breakfast photos, the files for your Kindle or Nook, and 6 more bonus printables totaling over 20 additional pages. This is an eBook only; nothing will come in the mail. With over 50 family-friendly recipes, key tips for planning ahead, hosting a brunch and the one food to have on hand to kickstart your family’s “5-a-day” fruits and veggies at breakfast, this book will be your guide to healthier mornings. Any coupon code is entered after clicking the “Buy Now” button once the item is in your cart. If you can’t see the buy button, click here. What’s in The Healthy Breakfast Book? 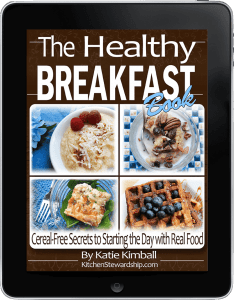 I’m offering a free preview of The Healthy Breakfast Book for you to sample – it has the full table of contents, plus some recipes that you can have for free so you can get a feel for the style the book is written in before you buy. If you are looking for many of the ingredients needed in this book, and not finding them because you don’t have a Whole Foods in your area, definitely check out Thrive Market. They have a huge selection of items like coconut flour and even some yummy soaked granola when you need a quick fix. You get a 30-day free trial but it doesn’t start until you place your first order so you can browse to your heart’s content. When you’re ready you’ll receive 15% off your first order, no coupon required. I’ve been waiting to share these photos! Isn’t the green fabulous? 1. 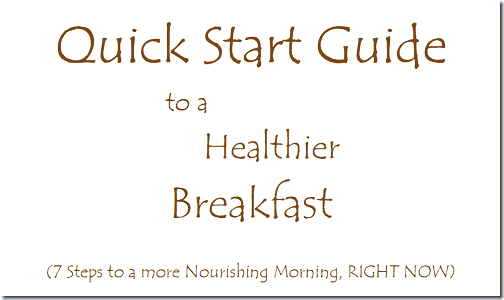 “Quick Start Guide” for The Healthy Breakfast Book: One page, top 10 tips from the book, for those of you who love to open a box and turn on the appliance without reading a 100-page manual. Start better breakfasts NOW. 2. Breakfast Planner Printable: A blank two-week breakfast meal plan for you to “plug and play” plus a sample Master Plan and sample Allergy Master Plan! 3. 10 Ways to Zoop Up Your Oatmeal: Print this quick sheet to give you inspiration for your morning bowl of oats! 4. 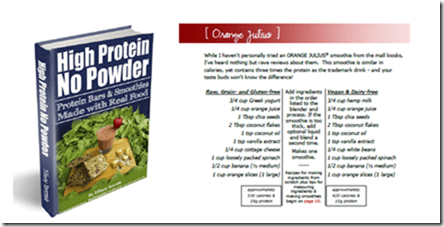 3 recipes from High Protein, No Powder: Protein Bars and Smoothies Made With Real Food eBook. 5. 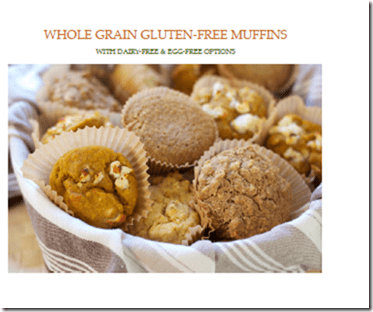 Whole Grain Gluten-Free Muffins mini eBook from The Nourishing Gourmet! These Gluten-Free goodies also have dairy- and egg- free options. 6. Two “Cereal” Imposter Printable Recipes: Mary at Homemade Dutch Apple Pie has shared two delicious recipes for making your own “cereal” to have on hand for rushed mornings (or a quick snack!). A 50% off coupon for The Healthy Lunch Box : Sandwich-Free Secrets to Packing a Real Food Lunch, the companion book to The Healthy Breakfast Book. Ever misplace a file or lose an eBook? Use this super-easy, one quick tip to find your purchased Kitchen Stewardship eBooks in a minute or less! Note: Only about 21 of the recipes in the book are also found for free online, less than half, and most of those are updated and enhanced with new options. It’s important to me to make any paid product worth it for my readers, but many of my favorite recipes are already shared for free – so it’s a balance. If you are unhappy with The Healthy Breakfast Book for any reason, including allergies that prevent you from making too many recipes, I will provide a full refund, no questions asked. If you’re a blogger and interested in the affiliate program, click here. Proud to boast the cover design of Blake Rudis. Disclosure: I am an affiliate of The Breakfast Revolution and will receive commission if you make a purchase there. Three cheers to Katie and all the sponsors! You Rock! An email went out today to everyone who purchased Healthy Lunch Box – if you don’t see that email just let me know. Just ate the Tropical Breakfast porridge. (minus a couple of ingredients) The free d/l, it was like eating banana pudding for breakfast! Really good! I had my doubts but I am happy and full now! Your recipe for making cold breakfast cereal out of properly prepared muffins was genius! I took failed zucchini muffins (made with less sugar and I subbed homemade plain yogurt for the milk, which made them extra tart) dehydrated them, as per the instructions in this book, and my kids were gobbling them up! You saved me from throwing food away and my kids got to have veggies for breakfast. Next, I tried making 2 beet-banana breads (1 with cocoa powder) and they were a hit! I am so excited to eat cold cereal again! (We do cereal Sunday, too. 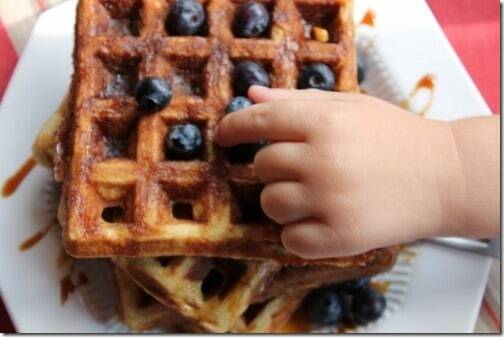 With little ones, it is hard to get to church on time, if I cook breakfast.) I can’t wait to try the rest of the recipes – squash everything & leftover mashed potato cakes! This book is definitely great for someone who is trying to make real food breakfasts, on a budget. I highly recommend.